Eight easy-to-build paper minis include a variety of gnolls and a hyena! Make sure you grab the Pathfinder Paper Minis Instructions here! While the artwork on these minis is great I have 1 complaint, it only comes with 8 different Gnolls !!!! Not even 8 because 1 of them is just a hyena. For $3.99 I would at least expect 10 different images if not more. For 1 dollar more I bought the sandy point miniature pack that came with 70 different minis. I honestly wish I could have returned this product. There are a lot of great tools on this web site for a better price. I will give 2 stars for the art work but that is the only thing that was satisfactory about this product. If you are running the Legacy of Fire, buy this and print them off - they will save you a fortune, look great on the table, and are easy to construct! A great buy! They are great if you need a ton of gnolls and are on a budget! Print away friends! I like the idea of these minis, but when I went to Kinko's to print it, they at first refused because of the copyright stuff on the bottom. I then dug out the question in the faq that says you are allowed to print ONE copy of a Paizo pdf. So at this point, I have to either buy a printer or go to a variety of Kinko's to get multiple copies made. Or maybe Paizo really does only want me to print one sheet of the minis. It seems like it would be easy to put "permission granted to copy for personal use" on the bottom of the sheets along with the copyright information. Either way, I like the idea, but won't be buying any more because of that issue. Gnolls! Gnolls! Gnolls! (Say it 3 times and they sound even funnier). A good mix of gnolls, both melee and ranged attackers. And they are the right size...BIG. These things will tower over your heroes, as gnolls should. And of course, the price. For less than $4, you get a nice hoard. then print them out to your heart's contenet and make your players weep. (I print them on two different setting: Letter and Executive, to get slightly larger and smaller versions of the same models so that you get even more variety). Another great addition to the LOF paper minis sets. Excellent set which includes a good selection of gnolls with different poses and weaponry. An extra hyena and a flind add variety. The figures are crisp, with a distinctive "cartoony yet scary" look. Assembly is super easy, and both the novice and the veteran of papercrafting will have a great time. Recommended on its own, or to complement the minis for the "Legacy of Fire" AP. These look awesome N'Wah! If enough of these come out, you might cure me of my expensive mini addiction. How often should we expect new sets? Well, I'm obviously behind, but the current plan is to have at least two minis sets per AP adventure (one for the key villains, one for the Bestiary), and assorted "extra" sets when the time allows. With luck, and hard work, the first villain set will hit the Store on Monday. The Bestiary is being handled by Immora, and Hugo's been kind enough to offer services as a minis artist working on side projects, so keep an eye out for more paper minis deliciousness! Also, though it may be a while (since she's working hard on the PaizoCon zine), Lilith has offered her services as well; she's leaning towards working on the Pathfinder GameMastery adventures. Let me guess? interlocking layers (with plus shaped pegs) like legs and arms to a Body to produce a three dimensional quality? Some day, yes. For now, though, no. But some day! These sets look fantastic N'wah! Well done to you and the other artists involved. What sort / thickness of card stock would people advising printng these bad boys onto? If you don't have access to a printer that can handle card, printing them onto paper, glueing the paper onto card and then cutting them out from there should work ... in theory ... right? Card stock or cover stock would do actually. Usually 65# to 110# will be fine through your printer as well but you'd need to feed it a sheet at a time. Set your printer description for either heavyweight or premium photo paper - that lets it know to gauge for thicker paper. Cool, thanks for the advise. Because there are no words that can express my accolades for this. I am rendered speechless by the sheer awesome I see before me. You have impressed a very, very, very hard to impress gamer. I tip my hat to you sir! Wow. Those are great. Awesome. Make more, I'll give you more money. Seriously, these look great. I'm a big fan of N'wah's art, but I didn't think I'd buy these; I don't use minis that much anyway, and I'm running LoF online, so no real need for minis of any sort. But these are just too cool, and I'm sure I'll end up using them one way or another. Congrats, you know my feelings on your mini's. I hope your feeling better after your tumble and yeah, really awesome. Really can't wait to see the next lot. Congratulations to N'wah and to Paizo for such an impressive result: community demands, member(s) produce, company delivers. And grows. Can't wait to see them in use over the oasis flip-mat or maybe even on Worldworks dedicated terrain. Actually it is currently $2.59 dollars thanks to PDF love. They're so, they're so ... so chaotic cute ! I just sent the link to our 100 + strong Pathfinder Society New York chapter. Awesome! Congrats N'wah! I can't wait to see more sets! This also shows how cool the Paizo staff is for supporting this! Congrats Ashton, you deserve the recognition. Nice stuff. So print out two of each design? Then they're only 25 cents per. If you do FOUR of each design, you're only paying 16 cents per miniature on the table! Eh, I think the pricing is fine. It's really not that much and the added value of what these products could bring to a game is too much to pass up. Only problem I can see is my players wanting a paper mini of their specific character as well. And look at it this way. Buy one mini in the store, that's going to cost around $7.00. And you still have to paint them. Here I can get my entire Gnoll needs in a fun and unique way with out having to track down a ton of Gnoll minis that would end up costing me way more than I ever wanted to pay. Keep it up. We'll be there for you. Why Gnolls first? 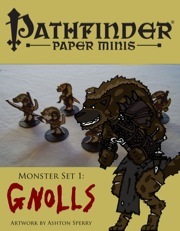 I don't have anything against Gnolls per se, but I wish there were Pathfinder goblin paper minis! Pathfinder goblins look so very different, that it's hard to find minis that do them justice. It's because we must all eventually give in and buy these goblin miniatures. Go to N'wah's devinat art page and some pathfinder goblins should be there unless I am mistaken. Yup; I've got an older set of Paizo goblins that Ben and I did. They're not arranged all pretty like the for-sale sets are, but they'll definitely do in a pinch. I'll probably be doing a newer goblin set as soon as I can, since Paizo goblins are awesome, but for now, you can satiate your goblin needs here (click on the download button on the left to, erm, download). On the pricing issue; as was brought up earlier, the amount you decide to print and assemble helps determine the total cost per mini. I've heard a lot of folks can get common minis from the WotC line for about 25 cents, but that 25 cents only gets you that one mini; if you need two, you'll have to buy another one. The paper minis are always available in whatever quantity you need them in. Before I forget, I'd love to see photos of these bad boys at the table, so feel free to put up links to your gaming groups slaughtering paper gnolls (and later, LoF villains, goblins, troglodytes, orcs, etc.). While getting to make money doing art is absolutely mind-blowingly awesome, the real joy is in seeing what you guys do with them. Printed, cut, glued & assembled the first batch of gnolls. Customized them to use the multi-purpose bases from OneMonk Minis. Excellent results, maybe tomorrow I'll take some photos. Overall very pleased, the scary-cartoony look is original and with a good impact on the tabletop. Yeah, black outline bases are easily done. I'd thought about doing that from day one (at the very least, it makes it easy to mark the bases with letters or numbers for keeping track of monster HP and such), but wasn't sure what folks were looking for, base-wise. Do you want the tops of the base white as well (the part connected to the minis' feet), or just the black circle bottoms? Either way, it'll take, like ten minutes in Photoshop to whip up the templates. These are great. Any chance for an NPCs of Sandpoint set? Not yet, but it's not out of the question. There's a good number of artists volunteering, and once I get caught up, I'll have some spare time to start working on more side projects. All the same, I won't promise a Sandpoint set any time soon. James Jacobs seemed to insinuate that a future AP might take folks back to Sandpoint (AP 7 is certainly going to be set somewhere in Varisia), so I'll have more of an excuse to work on them then. as soon as I am back from work today, I will buy those two sets (as I promised some time ago). I am sure they look even more awesome when I have them in hand. Now, would you please stop your normal work, so you can sit down to make minis for ALL PFAPs and modules! ;) I will buy them all (no kidding!!!). Great way to have exactly those minis you need, and in quantity as well. Great stuff, and really, really appreciated! Please, if your time permits, keep going at it. I would love to have them white. I sometimes put numbers on them. Especially when I am going to print more of the Gnolls and have a couple of them with axes or bows. This way I could number them easily, so to make notes on Gnoll-Axe-Wielder #1, or Gnoll-Arrow-Shooter #10. Absolutely awesome both these and the caravan stuff from your new partner in crime. However a thought in case you see this that could add usefulness in future ones that I would be interested in, again just a thought, but reusable stuff such as the camel or the hyena would be more useful with a page of just them so that if I needed lots of them I didn't have to reprint the gnolls or the cravan people. Just a thought for future releases. Also Good job! No prob on that front; actually, that was another idea I'd kicked around for a while, since it is a pain to have to waste paper and ink (or cut the minis you want out of the PDF and print them using a graphics program), so I'll do future sets with the "multiple" minis on an extra page (like a page with four camels or something for the caravan set, by way of for instance). The Pathfinder #20 set will probably have some bonus hyaenodons, so I'll probably do them on a separate page to make it easier to reproduce them (the other guys can go on one page since they're all named villains that you'll only need one of). Also, I've essentially finished the "Howl of the Carrion King" set; I need to print and assemble a set and photograph them for the cover, which I'll do tonight (Ben has the cardstock supply and the camera, and he's out doing some kind of construction work with a friend of our today). They have white bases with a thin black outline, which should save ink since two guys in the set are Large (one is also Tiny, and boy do I mean Tiny; I'm hoping that Tiny minis are a rarity, because they're basically just blobs of color). With luck, it'll be up for sale Monday night, depending on Vic's Monday workload. In the meanwhile, I'm working on House of the Beast (I've done the BBEG for that one, and boy, is he awesome :D ), which I hope to have up by the end of the week. From there, it's just "The Jackal's Price," and we'll be all caught up until "The End of Eternity" ships out. Immora's still working on the Bestiary sets, and Hugo's going to start up on troglodytes next week. Keep me posted on suggestions, and thanks again everyone! hyaenodons + gnoll riders would be very awesome. I would by that in a heart beat. Also, I like the idea of putting the generics on one page so that you can just print out multiple copies of that page to save ink & paper. Glad to know I might have contributed a workable idea, but it occured to me as I was printing them. To be honest I made a few of the gnolls and sat them next to the slightly larger DDM ones and I found what I had suspected to be true; Your gnolls are easily equal in quality to the better ones and miles ahead of the newer and worse ones. and at the overall price your gnolls are leagues better. Tried to upload yesterday, but my internet connection went suddenly FUBAR. I customized the minis to use multi-purpose switchable bases from OneMonk - the ones shown are the Wastes color scheme. The latter photos show an ambush of sorts, set up using some elements from Worldworks "Exteriorworks Hinterland" set. To me, bot tops and bottoms with the outlines would be fine. Clear/lightly colored tops are useful for noting code numbers or HPs/status/ongoing effects, and bottoms can be given a custom coloring with a felt pen/color marker. Just finished my caravan set - awesome! Golem101 - thanx for the link for those great bases. Something I surely will order. The bases from OneMonk are free! Hah! Awesome. I love it, and the One Monk bases are pretty awesome, I'll admit. I think I mentioned this... somewhere (don't remember what thread), but yeah, the next set, and all further sets until a popular demand uprising occurs, will be simple white bases with black outlines. You'll be able to check them out this week (possibly as early as Monday night), but I'm still waiting on some more cardstock and the camera (oh, and some good lighting; the lighting inside the house at 3 a.m. leaves something to be desired). Question: I've finished a hyaenodon (don't know if I've got it in me to do two different ones, but either way, "House of the Beast" will have four of them), but I thought I'd check with folks. Do you guys want me to work out a way of mounting a mini on top of it (nothing special, just a platform for a mini to stand on)? I think I've got an easy way to do it, and one that could simply be left off (well, cut off, but who's counting) if you didn't want it on there. Just checking out how you guys feel about the idea. While mounting woudl be cool, I'd be content with just sticking the mini beside the mount. My roommate wanted these so I indulged her, my only concern is trusting her with scissors.